Do you feel inspired by nature, fantasy, or science? Does trying on a unique and elegant necklace make you light up inside? Do you love gemstone jewelry with a little something extra? If you answered "Yes!" to any of those questions, I think we will get along great! 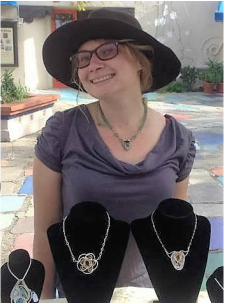 My name is Kellie Roussos, and I am fascinated by gemstones, minerals, magic, and wire. 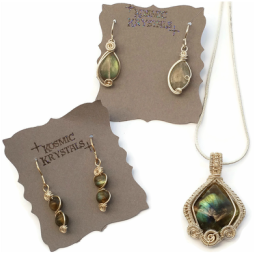 ​I am the Chief Visionary officer behind Kosmic Krystals jewelry, where I design gemstone amulets with an enchantingly elegant style for unique women. ​The artisan jewelry in my collections contains semi-precious gemstones for a touch of ancient magic. Each high-quality piece is carefully crafted with a dedication to fulfilling my clients’ desires. In my designs, I strive for the perfect combination of impressively intricate wire work with a tasteful elegant style. ​I use carefully placed weaves, coils, swirls, and spirals of sterling silver wire to set and accent natural gemstones. When I finish a piece of jewelry I am often amazed at the transformation of a simple stone into wearable art. Many customers often remark that they have never seen anything like my designs, and become quickly enchanted. My passion for making jewelry started very young. Basically, I was playing with beads as soon as my ultra-crafty mother trusted me not to swallow them. My jewelry boxes were quickly overflowing with bead work, glass, and polymer clay that I experimented in. ​Then, during college at Humboldt State I finally found my craft: wire wrapping. ​I only took one lesson, then fell fast in love with the creative freedom wire work offers. I quickly developed my own techniques and signature style by spending all of my time coiling and weaving wire. Even today I keep evolving new techniques to keep my designs fresh and unique, and because I just can't help designing! I carefully design my jewelry for quality and durability. I use skillful techniques to balance secure and sturdy wire wrapping with elegance. I anchor any decorative spirals with thin wire, and use thick work-hardened wire for any areas that may be exposed to stress. I ensure nothing is going to snag and pull apart by the techniques I choose. Then each piece of jewelry is closely evaluated for quality control. I carefully select quality natural semi-precious gemstones and shells from all over the world to feature in my handcrafted jewelry. Labradorite, rainbow moonstone, and opal are some of my favorite stones to work with. I love the translucent beauty of chalcedony (especially agates and carnelian that I collect and polish myself). Quartz crystals, as well as peridot, aquamarine, and tourmaline are also wonderful to work with, ether as rough stones or faceted gems. I also work with opaque or softer stones like lapis lazuli, turquoise, chrysocolla, amazonite, kyanite, and rhodochrosite. My portfolio would not be complete without the creations of the sea. Some of the first wire-work pieces I ever made were with abalone shell, cultured pearls, fossil coral and ammonite shells. Learning about the properties, histories, and formation of these stunning materials motivates and inspires my jewelry. The OOAK jewelry is made to be intricate, impressive, and totally unique. The simpler repeatable jewelry is perfect for everyday wear, and is made with carefully refined and perfected designs. Every piece is still a little unique due to natural variation in the colors and patterns of the stones, as well as variation due to the handmade nature to ensure your piece is truly special. ​Both the OOAK and repeatable jewelry coordinate beautifully together into cohesive sets and collections. However once the OOAK pieces are sold, they are gone for good! Make sure you have first access when new collections are released by signing up for my newsletter. Visit the Kosmic Krystals Storefront. Easily find the piece of Kosmic Krystals jewelry that calls to you. Make sure you're among the first to know about new releases by signing up for my email updates. As a member of my community you will get exclusive sales and discounts not available to the public. If there is a completely customized design with specific gemstone types, properties, or style that you have been dreaming about, see the Custom Order page and Request Form to learn more. Join me in the Blog for a magical learning experience! In the Blog I will be sharing the inspiration for the themes that drive my new collections, behind-the-scenes techniques, gemstone historical and metaphysical uses, gemstone jewelry cleaning guides, and so much more!